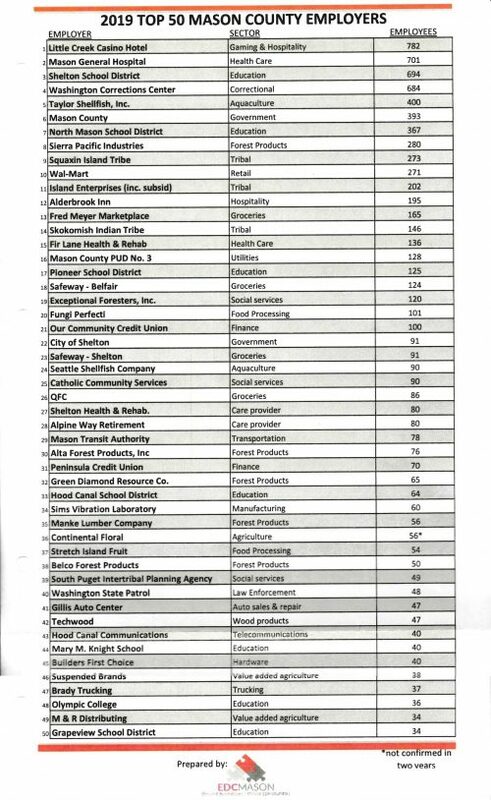 The Economic Development Council of Mason County has compiled a list of the companies in the county with the most employees. Topping the 2019 list with 782 employees is Little Creek Casino. Mason General Hospital follows with 701. The Shelton School District sits third with 694. The Washington Correction Center is fourth with 684 employees. Taylor Shellfish rounds out the top five, employing 400 full time. Mason County is sixth on the list with 393, followed by the North Mason School District (367), Sierra Pacific Industries (280), the Squaxin Island Tribe (273) and Wal-Mart (271) wraps up the top ten. Mason General Hospital & Family of Clinics presents "Meet the Providers"